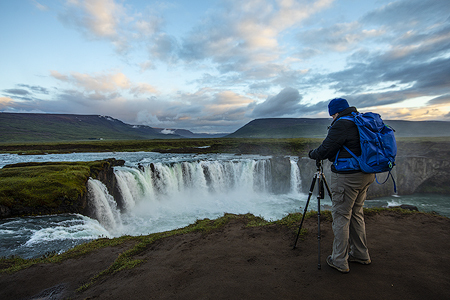 Iceland is a bucket list location for so many. This small island nation in the Atlantic ocean, once not even on the map for many tourists has, within the past decade turned into one of the MUST see spots on the globe. 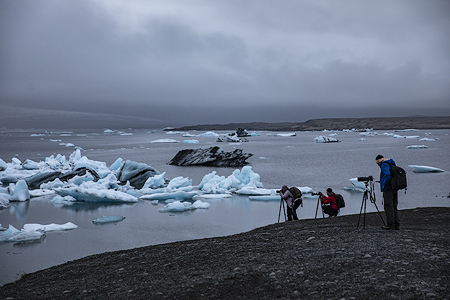 A desolate and rugged landscape, forged by ice and fire Iceland looks like no other place on this world. If one was left to only using words or writing to describe it the place to their friends and family, those couldn’t do it justice. 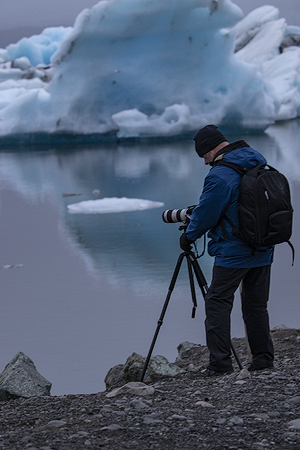 Thankfully the world of digital photography exists so that we can bring back the photos of these locations and share those. 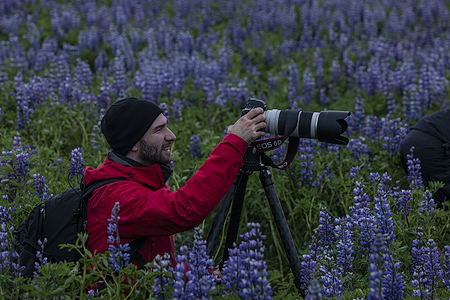 Each year I’m happy to bring a different group of photographers here so that they can experience the magic of the midnight sun and bring home their own images of this wonderful location. 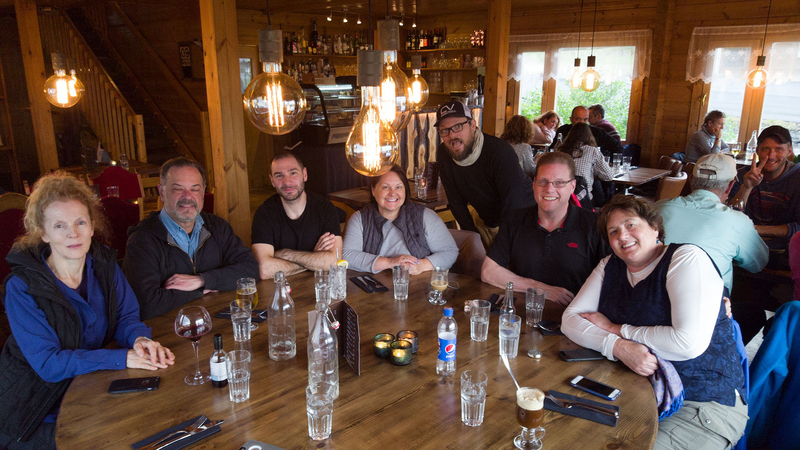 I met my small group in Reykjavik for our first day of shooting. We meet up around 4pm for orientation, followed by a nice fish and chip dinner downtown. I know my group from pervious adventures so it only takes us a brief period before we’re all dialed in and ready to explore the island. 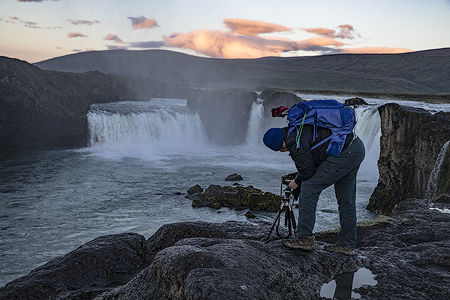 Our first stop for the shooting portion of the evening is Öxarárfoss, in Þingvellir National Park. 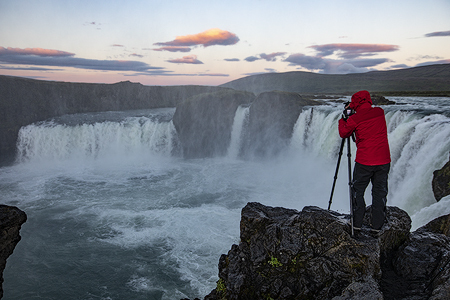 This waterfall isn’t one of Iceland’s most amazing, or largest falls...but it’s a nice start. The most impressive part is walking between two slabs of land being torn apart from deep within the earth as the North American and Eurasian tectonic plates stretch apart. 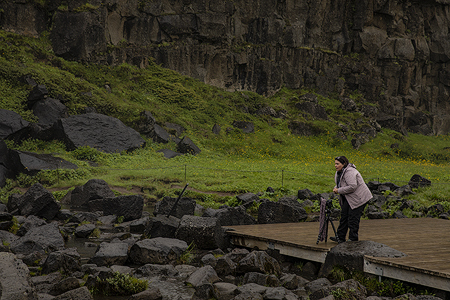 This park was once the meeting place for all the different clans of Iceland, here they would discuss laws, and set the rules of the land...now it’s home to some beautiful scenery and our first stop of the night. I help the group to set up and find the best foregrounds to photograph this small but beautiful waterfall. 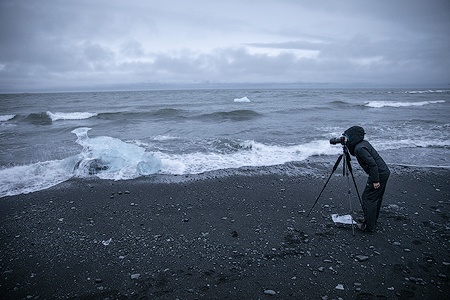 The weather is grey and overcast, a typical Icelandic welcome. Everyone is still in some stage of jetlag, so we’re not staying out too late, nor too long at each location. 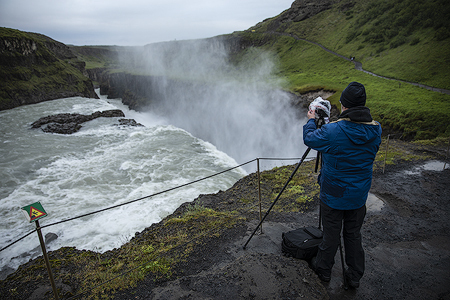 It’s time to move on to the next stop- Gullfoss. 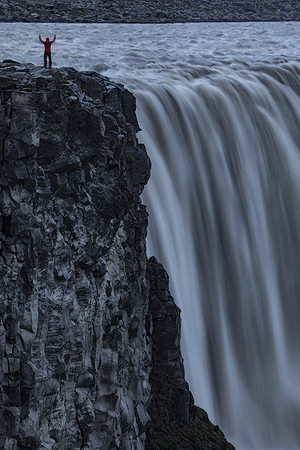 Now we’re moving on to one of the big-boys in the Icelandic waterfall scene. 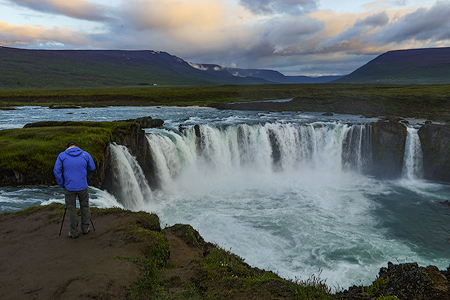 This falls, which translates to “Golden Falls” is the jewel of the Golden Circle tourist route, which is one of the more popular day trips outside of Reykjavik. This giant fall drops into a narrow canyon, where it creates a massive wave of mist. 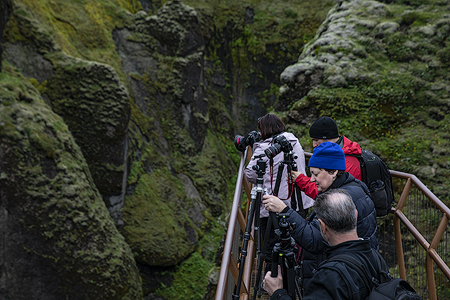 The mist was blowing pretty hard towards the higher vantage points when we arrived so we moved closer to the precipice of the falls so we could work on some cool detail shots, and shoot looking up the canyon. 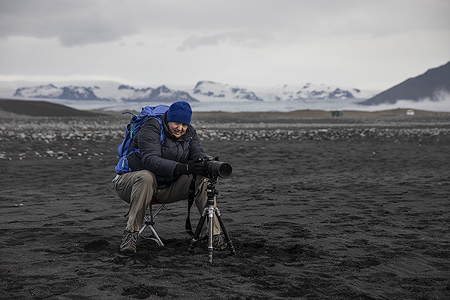 It’s typical that during any part of a location, winds will shift and what was once dry shooting becomes engulfed in mist. Once our lower shooting spot became too misty to photograph we moved back up and concluded our shots from a higher vantage point. 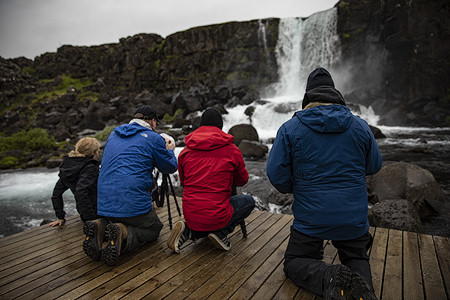 This stop is always a great first foray into the wild power of Iceland’s wild nature. Our final stop for the night, isn’t too impressive if you’ve been to Yellowstone before, and seen Old Faithful...but if you’ have a soft spot in your heart for geothermal geyser activity..it’s always good to see the one that they were named after. Geysir is a small geothermal area, and the location where the term ‘geyser’ was coined. Strokkur is the geyser here that goes off with very reliable 5-7 minute shows. 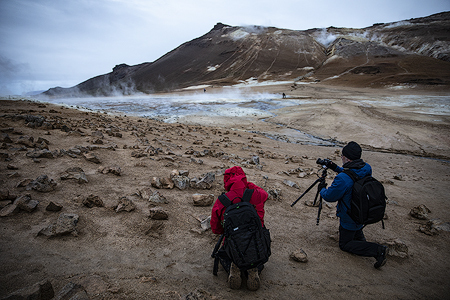 Our group had a lot of fun trying to time the explosion with their images so they could capture the cool ‘blue bubble’ that develops an instant before full explosion. It was after midnight by this point, and the group was beginning to feel the effects of their travels and long day. We made the drive back to Reykjavik and everyone was able to get a full sleep before the start of our second FULL day in Iceland. We head out after breakfast to the town of Vik. This little coastal town is awesome. 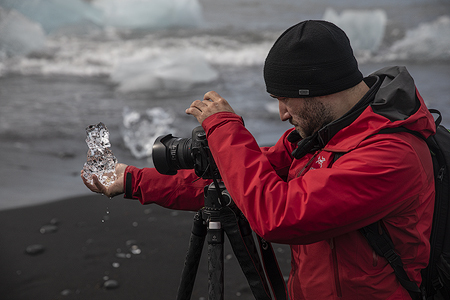 There is all kinds of different things to photograph in this region. 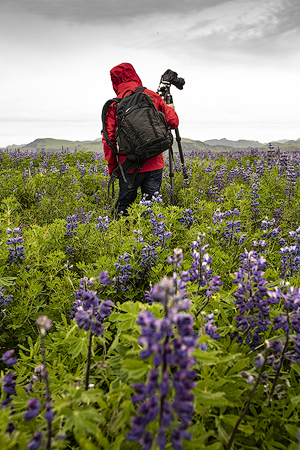 There are two massive waterfalls along the route worth spending time at, as well as coastal sea arches, sea stacks, puffin nesting grounds, and churches surrounded by fields of blooming lupines. Our goal is to try and get to as many of these locations as we can. We do all of our main shooting in the evening, which means we won’t be fighting tour buses full of other folks trying to get in the way of our creative process. 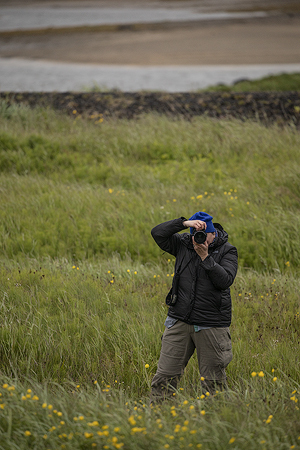 Our first stop for the night was an attempt to find some puffins. 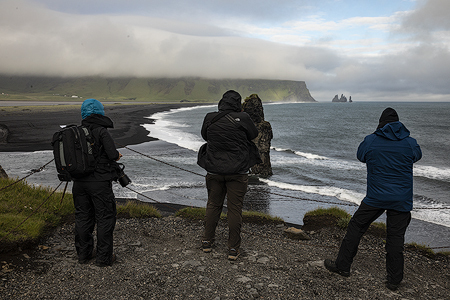 We drove up the hill to Dyrhólaey where we could check out the sea arch, and scan the cliffs for some puffins. High winds and fog made the chances of seeing any of those things almost impossible, but we gave it a try as long as our hands and faces could take the wind and cold. We vowed to try again in the end of the evening when the forecast looked to be better. 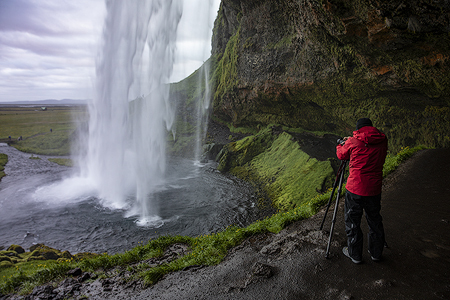 Our next stop was Skogafoss. This curtain falls is right off the main ring road and one of the icons of the southern coast. 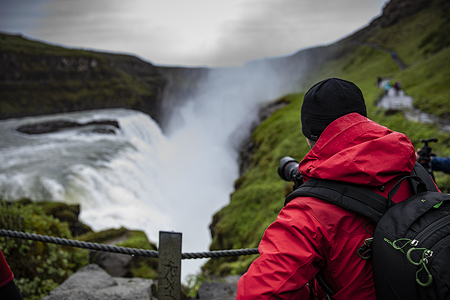 We arrived and had the place ALMOST to ourselves, except a couple instagram photographers trying to shoot their red tent in front of the falls. Thankfully the small crowd and high winds was enough for them to get discouraged with their endeavor, and they both packed up their tent (though we all secretly hoped it would blow away into the sky) And we had some time to shoot the falls without their ‘prop’ With all the waterfalls here I like to encourage folks to play with their different shutter speeds to see how they create different moods with each waterfall. 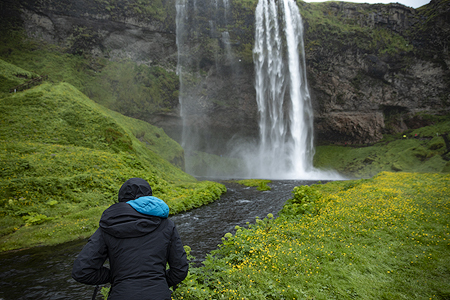 The next stop was the other iconic waterfall of the south, Seljalandsfoss. This waterfall is one of the few in the country you can walk behind, which is where all of the group went to shoot first. 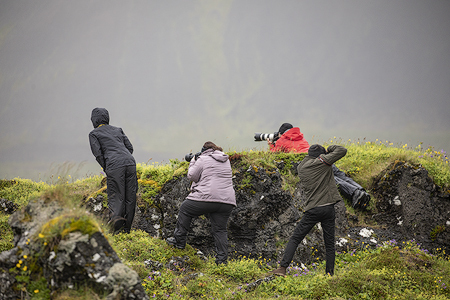 The mist here is a little on the wild side, so once again our group is constantly moving about to try and find the best and most mist free shooting. 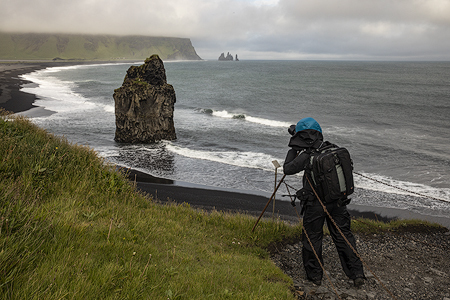 As promised our last stop for the night was another go at shooting the cliffs above Dyrhólaey. The fog had lifted (though the wind still stuck around) Though we saw some puffins, there weren’t too many around on the cliffs to get really good images of. The midnight sun was going strong though and pleasant bits of color dotted the sky. 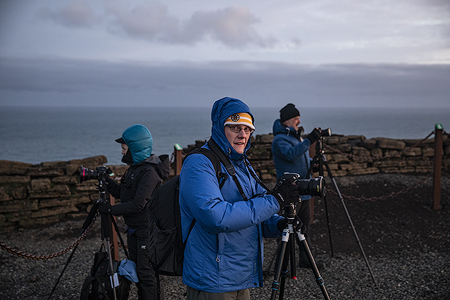 THe group braved the gales and got some shots of the sea arch and the lighthouse at the end of the trail, before retreating to the van. Everyone was still catching up on sleep, so after our drive back down the cliff we set our sights back to our wonderful hotel in Vik. 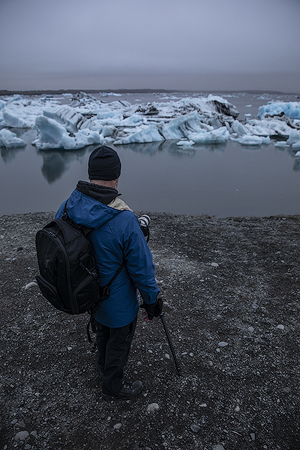 We move east towards our hotel on the outskirts of the mighty Vatnajokull glacier. On our way east we make a stop at a cool little canyon. 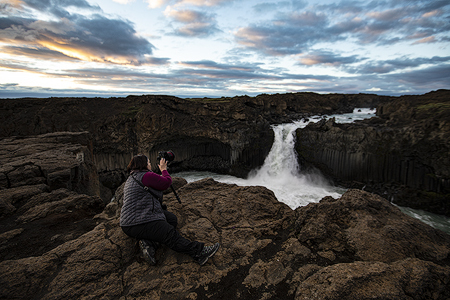 Fjaðrárgljúfur canyon is not only hard to spell, it’s hard to pronounce...but luckily it’s easy to photograph. 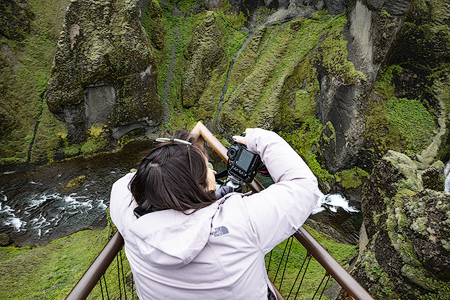 They’ve built a few little platforms that are in the perfect spot to grab some shots of this moss covered canyon. 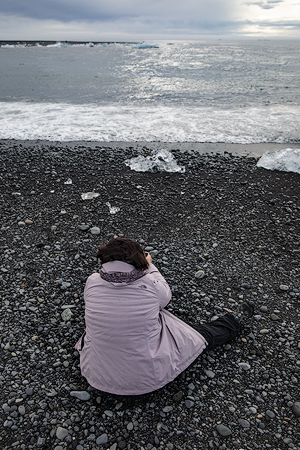 The main focus of our nights in this location is the famous Jokulsarlon and Diamond Beach. 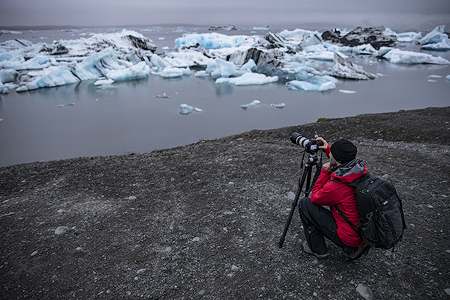 At the foot of the glacier a lagoon has formed and fills with the giant icebergs that have calved off the glacier. This makes for amazing photographic opportunities. 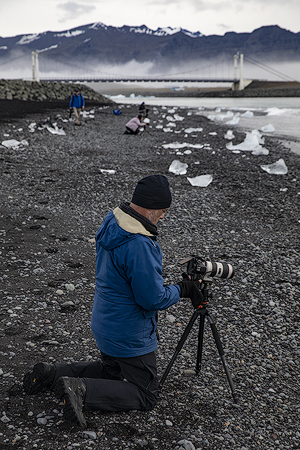 That ice in the lagoon gets transferred by the tide to the ocean and the gets deposited on the adjacent beach...all these chunks of ice are what then becomes “Diamond Beach” We spent two evenings and mornings in the area shooting the chunks of ice on the beach, and photographing the bergs in the lagoon under different lighting conditions. There were periods of great reflections and I encouraged folks to try to take some panos of the spot to show the scale and vastness of the area. During the afternoon of Day 3 we spent a few hours looking at images and working on some post processing. This is always one of my favorite parts...getting to see everyone’s images and look them over so that we make the most of processing them. With our time on the southern coast coming to an end we make the long drive North to Akureyri and our nights on the Skjaldarvik horse farm. This family run business is one of the guest favorites on every trip. The hospitality and service here are unmatched. They offer a great experience, and wonderful food and service to boot. 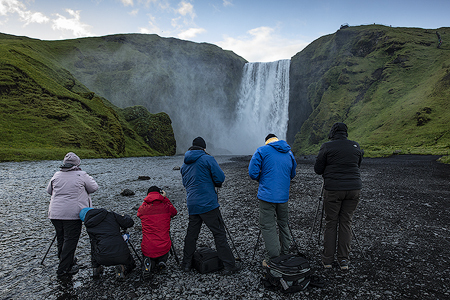 During the evenings and mornings we spent shooting, and our down time the group can relax, take a horseback ride, or spend time strolling though the fields and photographing the horses and their foals with some of the best backdrops in the area. 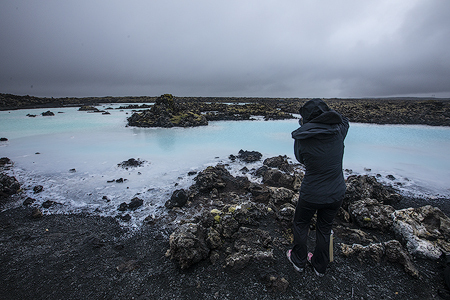 Our first night we went to the geothermal area Námafjall here we explored the mud pots, and steam vents under a moody, dark sky. The smell and textural mud here can be a bit much, but the group was up for it and I think, looking back they had a lot of fun shooting here. 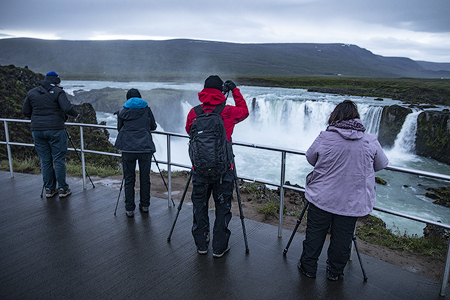 Our next stop was the popular Godafoss, or waterfall of the gods. This waterfall has a unique blue-green color and a awesome horseshoe shape. We shot it from above and low along the bottom...the moody sky was awesome for really bringing out the color of the water, and moss on the rocks. 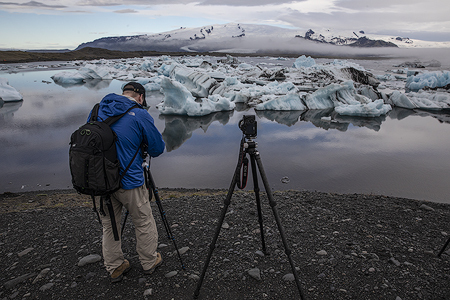 While I think folks were a bit discouraged with the sky when we arrived..when they saw the images in their processing the next afternoon they all loved the shots...Iceland is good like that for providing stellar images in any kind of light. 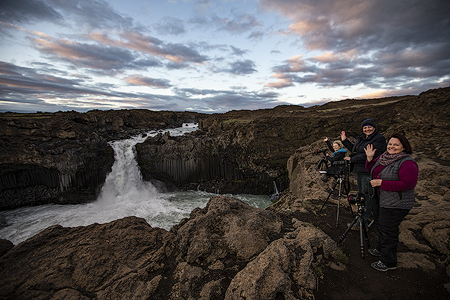 The next night we set off for Aldeyjarfoss, a remote and bizarre waterfall in the highlands of the north. 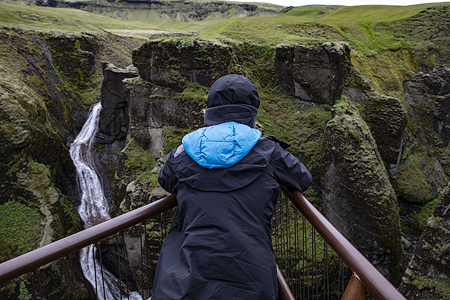 This waterfall sits alone in the basalt covered amphitheatre where few tourists ever set foot. We arrived and had the entire place to ourselves for the majority of the evening. The group had great light and sky color here to work with and really made the most of it going high and low to get different angles of this mighty waterfall. 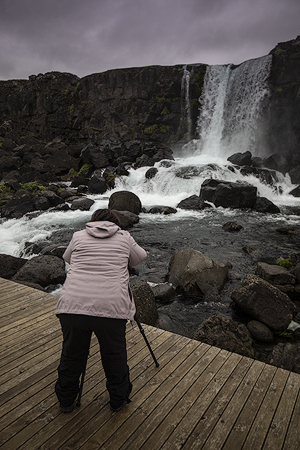 The road to ALdeyjarfoss is right next to Godafoss (they’re on the same river) so we of course made another stop there to try and get some more images from the opposite side of the falls. 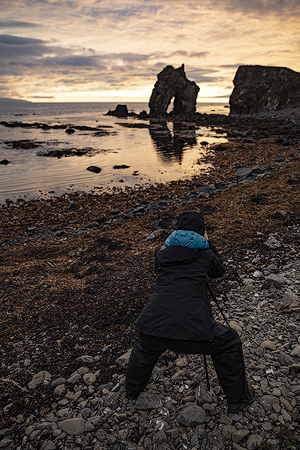 Our final night we set off for the tiny town of Husavik, where we had an amazing dinner and tried to make use of the awesome evening light by shooting Rauðanes Point and a unique little sea arch located there. 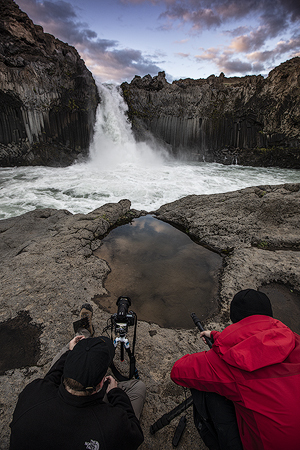 The light was beautiful, but while we made the most of the conditions we had, the tide was not cooperating so we went ahead and set off for Dettifoss...the most powerful waterfall in Europe, and another example of the raw power of Icelandic nature. The morning came and it was time to bid our wonderful hosts and horse farm adieu and head west. Off to Snaefellsness peninsula and the tiny fishing town of Hellnar. Here we would spend the next two nights exploring this awesomely diverse peninsula. The weather forecast for these days was a little daunting. 60-70 mph winds were expected and high wind advisory was in effect for the entire peninsula. Our first night we made a brief attempt to get out, I should say the guys in the group made an attempt. The ladies wisely sat in the warmth of the lobby and played cards while we got blown all over the road in crazy winds...and ultimately found nothing to shoot. The next day we made a go of trying to get out. 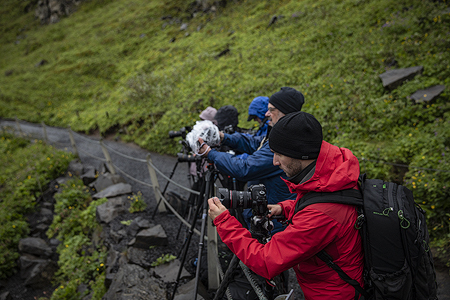 We shot sheep near the tiny black church at Budir, and the wind and rain let up enough for us to get some nice images of these fluffy little staples of the icelandic landscape. 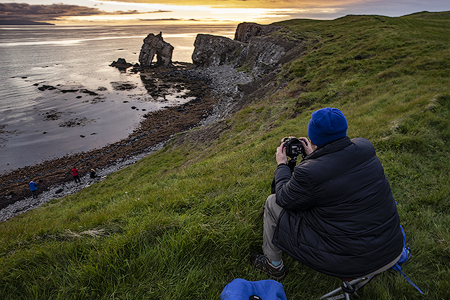 We also got some nice shots of the little red-roofed house in Arnarstapi, which has become an iconic shoot, thanks to the wonders of social media. The sun even made a brief appearance! We tried to hike into a slot canyon, and got turned around by gale force winds and giant chunks of snow blocking the way. 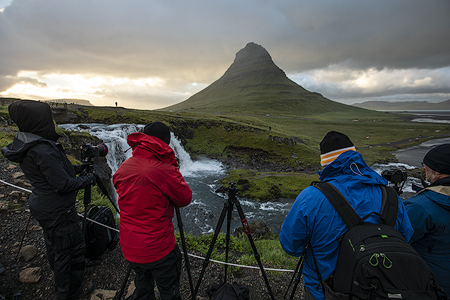 We got some great moody light that evening at the famous Kirkjufell and the nearby Kirkjufellfos. This pointy ‘Axe-mountain’ has become a must shoot location for all landscape photographers...and funny to think when I first came in 2010, I just walked right by it because few people had shared any images from here...now EVERYONE goes here, and they’ve built in trails and everything. 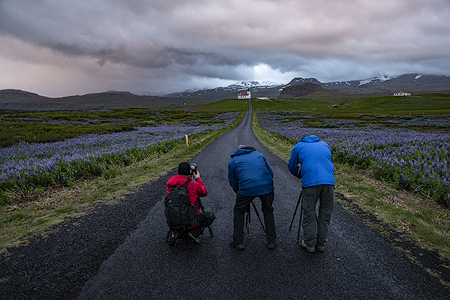 The weather I think scared away the crowds because other than a few others we had the place mostly to ourselves and were able to shoot the best vantages while we watched a crazy light and storm show take place. 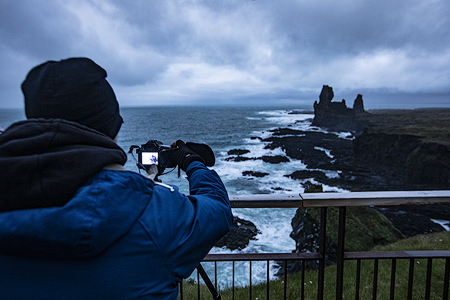 We stopped at the Malarrifsviti lighthouse and the crazy Londrangar sea stacks. Though the first day gave us lemons, we made the most of our second night and tried to make a little lemonade on our last full day shooting. Back to Reykjavik. 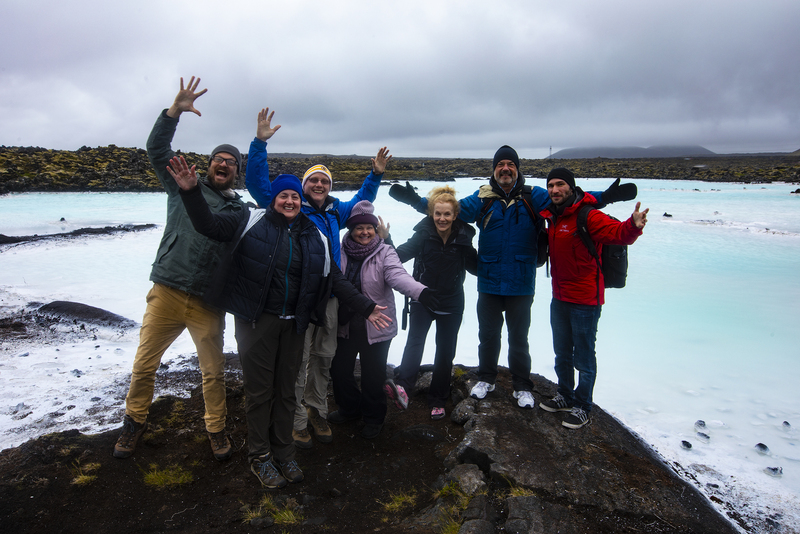 We rested a bit, and then went out for an amazing dinner at the famous Icelandic Tapas house before setting our sites on the Blue Lagoon for a little photography and a relaxing night in the mineral rich waters. The water was relaxing but we had the best time talking with Vigdís, the local girl who worked in the lagoon distributing silica face masks. 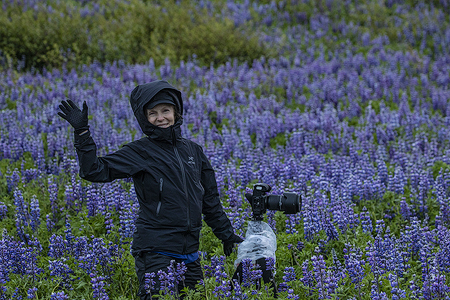 She gave us a very entertaining discourse in all things Iceland and answered all our many questions. She made the experience a bunch better than we expected. With our fingers pruned and our minds relaxed we made our way back to the hotel. 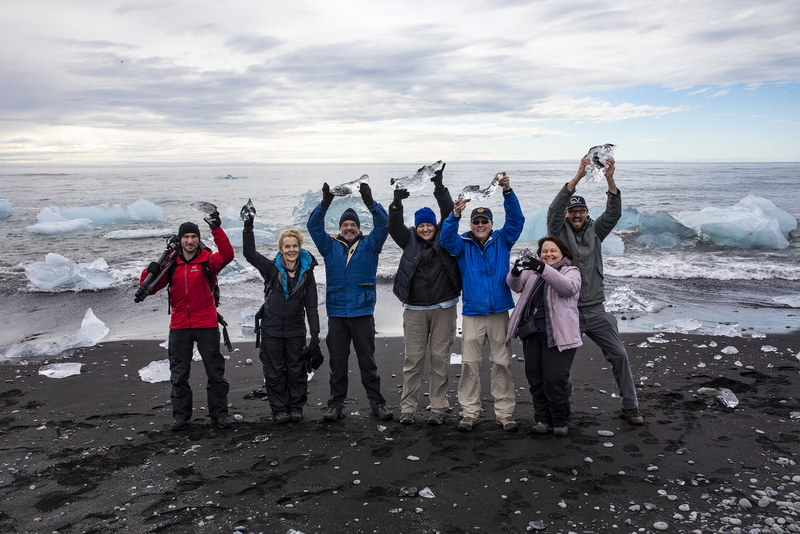 What an excellent way to end a great trip filled with laughs, long hours, great food, fun times processing images, and the beautiful Icelandic landscape as the backdrop the entire time. Thanks to everyone for making this one of the best adventures in the country!